Pottery attracts people of all mindsets and capabilities. There’s something about taking a piece of clay and partnering with it to create a usable or decorative vessel. We offer classes in both wheel thrown and hand built pottery. Try them both! You will walk away with a profound sense of accomplishment and a deeper appreciation for pottery. Our pottery students say the classes make them more focused, patient, calm and confident in their day-to-day lives. Art Alliance Pottery classes meet in room 129 of the Greensboro Cultural Center weekly for 7 or 8 weeks per session. There are 6 sessions per year. 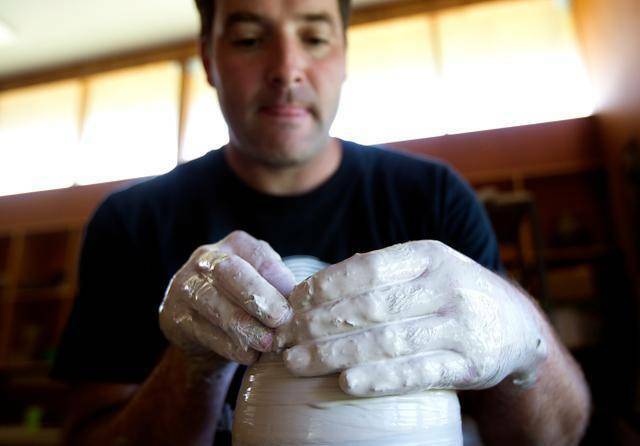 Studio classes include wheel throwing instruction, handbuilding, and glazing techniques in a relaxing atmosphere. Class size is limited and pre-registration is required. A waiting list is kept when classes are filled. The fee is $145 (unless noted below), which includes a bag of clay plus firing and glazing fees. Click here for a supply list. CLAY—One extra bag of clay may be purchased each session for $35, or you may bring in a bag of extra clay from outside if you pay a kiln/glaze fee of $20. However, no student is allowed to work with more than 50 pounds of clay per session. OPEN STUDIO—Open studio is available to current students and takes place when there are no classes, camps, or workshops scheduled and the building isn’t closed. Please review the Art Alliance Pottery Studio Guidelines. This class is designed for individuals who know the fundamentals of handbuilding, want to improve, and explore their creativity. Students may work on independent projects or be guided by weekly demonstrations. Basic wheel throwing skills required.